"Hannigan is, for those in the know, a marvel." So begins Anne Midgette's Washington Post review of the Canadian soprano's "remarkable" D.C. recital debut last night. At PCMS, we're proud to present one of the nation's premier vocal recital series — yet seldom has a singer come to the Perelman Theater riding quite the level of buzz that Barbara Hannigan is at the moment, less than a week from her PCMS recital debut with pianist and frequent collaborator Reinbert de Leeuw. The New York Times just ran a huge, video-filled feature today in advance of three upcoming performances in the Big Apple. While her Park Avenue Armory dates have been long-sold-out, fortunately for NYC vocal enthusiasts, Philly is just a short train ride away! Hannigan's new album Crazy Girl Crazy has met with one accolade after another. If you want to hear what "stupidly seductive" and "effortlessly bewitching" sounds like (The Guardian), click below. Also today Parterre.com joined the raves for Barbara's Kennedy Center recital. Ludwig van Toronto dubbed her the "Queen of the New" in a revealing interview at the start of her North American tour. And rumor has it that NPR will be releasing Barbara's eagerly-awaited Tiny Desk Concert any day now. 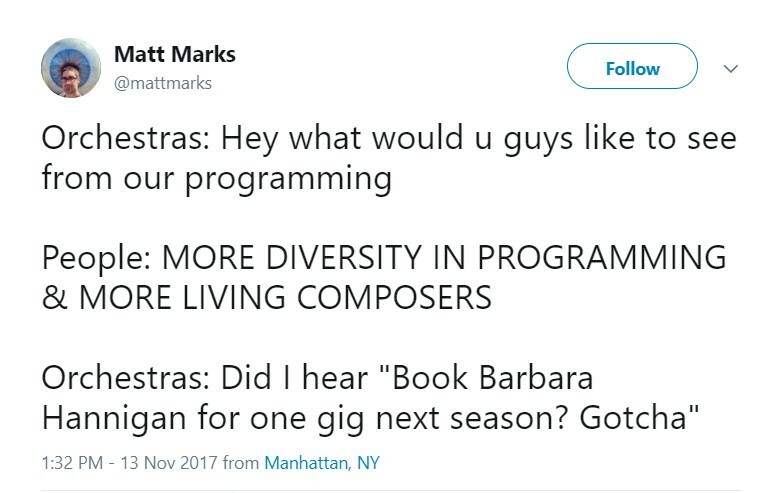 Composers are even referencing her in snarky tweets because every orchestra in the world is knocking on her door. Lest our discerning audience sense anything superficial in this raft of publicity, allow Anne Midgette to dispel any such fear. "Hannigan is an artist who sings," she writes. "You can see it from the moment she comes out on stage, evocatively dressed in an asymmetrical gown that exudes a kind of careless glamour. Beauty, be it physical or vocal, is incidental to what’s going on here — a mere byproduct of an act of communication." In her November 21 program, Hannigan offers an artfully curated look at the Second Viennese School, where new musical language was developed through the extraordinary collaboration between composers, painters, writers, and other artists in the city’s salons and cafes at the turn of the century. "Intense and focused and bittersweet as a slice of Sachertorte and a cup of strong coffee in a Viennese cafe, and imbued with the same evocative, lingering aftertaste" is how Midgette memorably describes it. Long story short — if you only attend one PCMS performance this fall, make it this one. We guarantee it will be a memorable night with one of the most virtuosic and inspired artists of our time. Barbara Hannigan, soprano and Reinbert de Leeuw, piano appear on Tuesday, November 21 at 8 pm at the Kimmel Center's Perelman Theater. Tickets are $30. To purchase tickets or for more information, please visit the concert page or call us at 215-569-8080.